Family details: Juglandaceae. 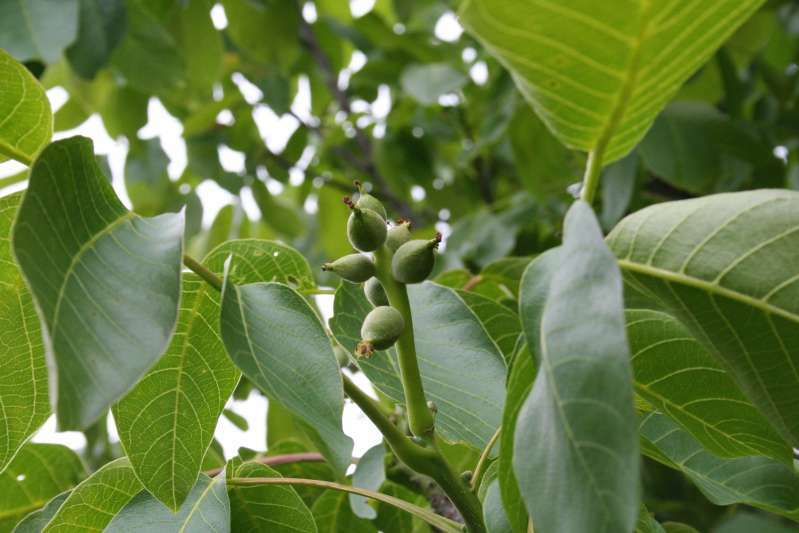 Other trees in family include carya (hicory, pecan) and pterocarya (wing-nut). Utilization: Wood is used in furniture making. Unripe fruit can be pickled, before the shell forms. Ripe nut is the familiar commercial walnut. The bark and the husk from the nuts can be used for dye: when pickling green walnuts it's very necessary to wear rubber gloves or you end up with dark brown hands. The ripe nuts also have proven health benefits. Habitat: Native of S.E. Europe and W. and C. Asia to China. Introduced elsewhere.Commercially important in California. Planted and sometimes naturalised in S. England. In more northerly limits of its range, growing tips can get frost damaged which affects the shape of the branch structure. Cultivation: the walnut is of considerable commercial importance, probably being the main source of nuts outside the tropics. Pollination by wind. Male catkins appear in early srping, before the leaves. After they have released their pollen the female flowers and leaves start to grow and the female flowers are pollinaled by air-borne pollen, which may have been released 2 to 3 weeks earlier. Flowers are borne on a raceme. Seed distribution: is by squirrels, mice and similar small nut-eating rodents. These small mammals rend to bury uneaten nuts for future use and evolution has clearly favoured forgetful animals - as the unrecovered nuts grow and become mature trees! Photograph 1 (taken 30th May 2008) shows a 20 year old walnut tree growing in the author's garden. This one's growing tip was damaged at about 2 years old, so has a double trunk - which makes it an ideal climbing tree for the children (and for picking the nuts). Photograph 2 (taken 30th May 2008) shows a raceme of immature nuts. This page was written too late to photograph the male or female flowers but the shape of the female flower spike is reflected in the baby nuts. Photograph 3 (taken 31st May 2008) shows the 'June drop'. 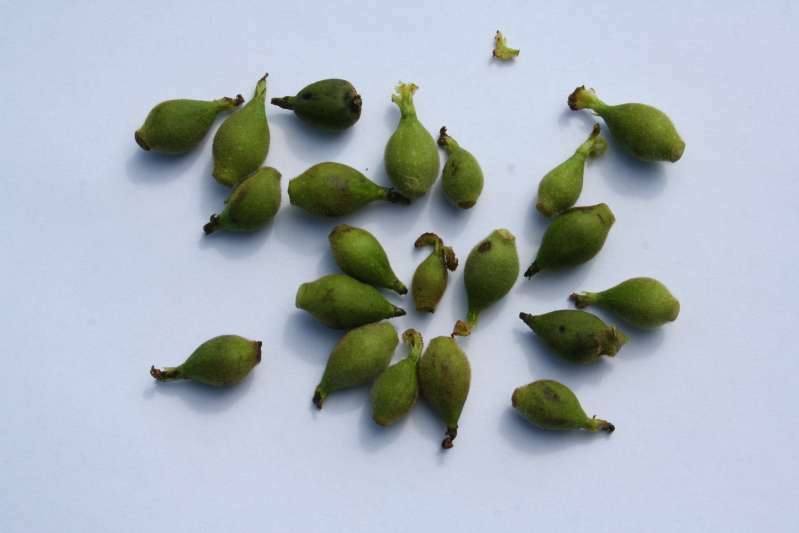 In common with many other trees, the walnut sheds copious quantities of baby nuts. You can of course pickle these: no point in salting them as they don't contain so much water as large green nuts. Also they remain hard, unlike full size pickles. 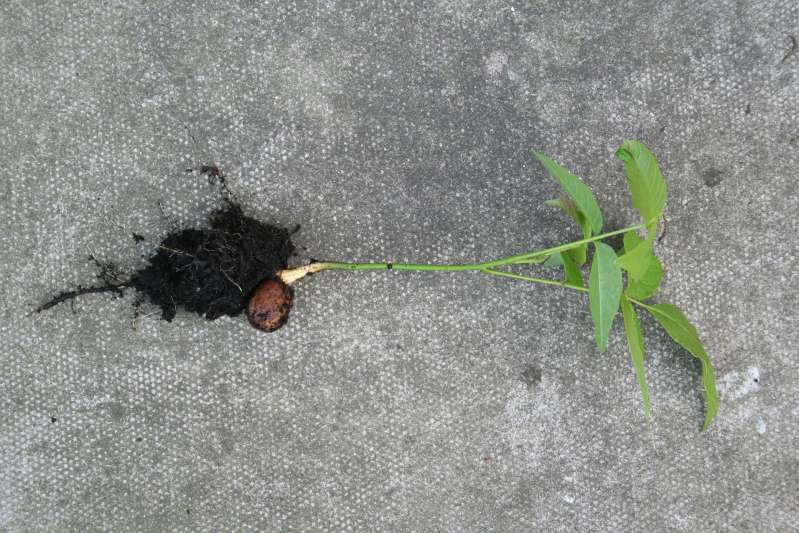 Photograph 4 (taken 30th May 2008) shows a seedling tree growing in a patio pot where it was planted by our local squirrel! 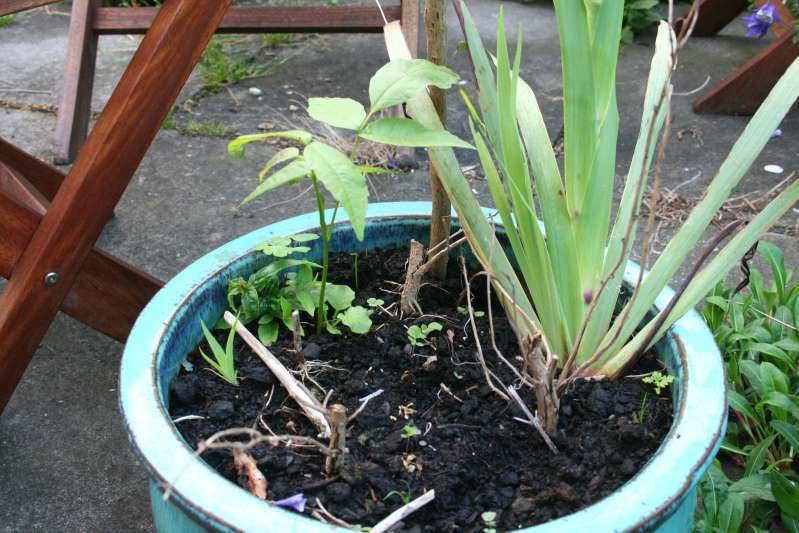 Photograph 5 (taken 30th May 2008) shows the same seedling removed from the pot. 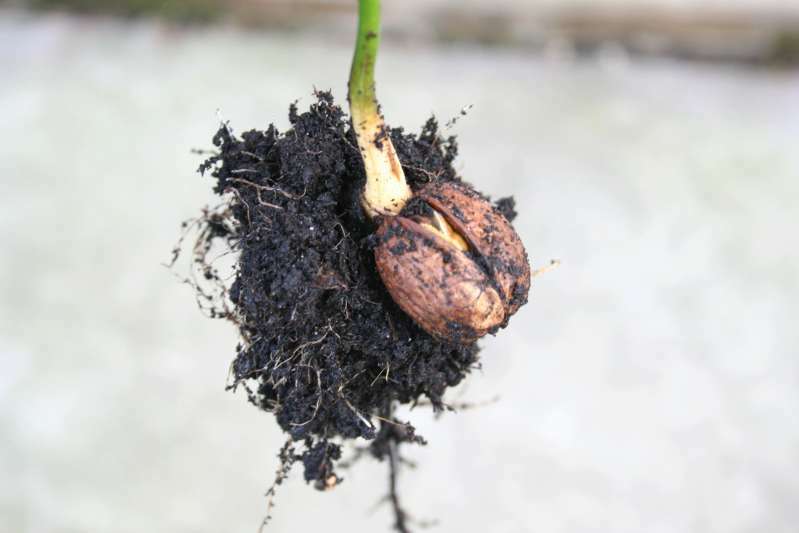 Photograph 6 (taken 30th May 2008) shows detail of the above nut showing trunk and roots growing from the sprung nut. Recipes The walnut is so well known that there are many sites on the internet offering recipes so try a Google search for walnut recipe. Page first published 30th May 2008.